The making of Usher’s sixth studio album was inevitably affected by the end of his marriage and its aftershocks. “Papers,” the early buzz single for Raymond V Raymond, bears the closest relation to the turbulence he experienced. He pours himself into that song more than any other on the set, and breakup lyrics don’t get much more specific than “You don’t think I know what’s up, but sweetheart that’s what ruined us” or “I done damn near lost my mama.” The song was awarded the top spot on the R&B/Hip-Hop chart, most likely for its lyrical uniqueness since the song does not break out of an exceptionally repetitive twiddle. 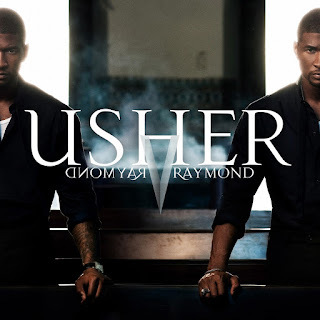 Many of the songs on the album have to be taken on their own, stripped of context; otherwise, determining what applies to Usher’s real and fantasy lives can be problematic. (Either way, it’s evident that long-term relationships might not be for him.) The sleek dancefloor track “So Many Girls,” one of a few songs in which Usher sounds dead in the eyes, going through the motions, desensitized by the bounty of women at his feet, is followed by the sarcastically titled “Guilty,” where he whines “I guess I’m guilty for wanting to be up in the club” -- which warrants a response like “Yes, attached 31-year-old man, that’s correct.” A few songs before that is a quasi-redemptive ballad “Foolin’ Around”; he humbles himself, seems to take responsibility for his actions, then casually drops “Guess that’s just the man in me, blame it on celebrity.” The album’s catchiest uptempo song, “Lil Freak,” featuring Nicki Minaj, is effective despite itself, swiping the synthesizer line from “Living for the City” -- a classic containing Stevie Wonder's most angered social commentary -- for the sake of Usher’s lesbian tryst. (The combination is as wrong as Eugene McDaniels' “Compared to What” and a soft drink commercial.) Otherwise, the slow jams and the few moments when Usher sounds as if he's having actual fun win out. Two of the best happen to be collaborations with Jam and Lewis and the Avila Brothers. “Mars vs Venus,” a very slow jam, soars, while “Pro Lover” is a breezy, casual number filled with sweet dub accents. Flac link is down. Upload please.